Future Facilities, a leading provider of data center design and operations management software, today announced that Mark Seymour, data center cooling expert and chief technical officer at Future Facilities, has published the first in a series of white papers explaining the importance of model refinement and calibration when predictively modeling the availability, physical capacity and cooling efficiency of a data center. Aimed at owner-operators, What is a Valid Data Center Model? An Introduction to Calibration for Predictive Modeling brings clarity to an area of data center operations that is increasingly important. For many data center owner-operators, using computational fluid dynamics (CFD) simulations to predictively model the impact that future changes will have on availability, physical capacity and cooling efficiency (ACE), or to help resolve ACE problems in a data center, is second nature. And, despite the historical connotations that CFD brings to mind – a complex and intimidating solution requiring expert knowledge to use – the reality is that predictive modeling has never been simpler or easier for the lay person to take advantage of. But the success of predictive modeling still lies ultimately in the hands of the user. Summed up colloquially as “garbage in, garbage out”, the most pressing dangers for predictive modelers are that their computer models lack fidelity and are uncalibrated. Why? Because low-fidelity models (garbage in) lead to inaccurate results (garbage out) that bear no resemblance to reality (uncalibrated). For some, the solution to the “garbage in, garbage out” challenge is not to improve the model and calibrate it, but to lazily fix the results of the model to match what is being seen in real life. “That renders the model useless”, says Seymour. Instead, “owner-operators and consultants must exercise due diligence: review and measure the actual installation, then improve the accuracy of the model until it produces dependable results”. So, how do you make the model dependable? How do you calibrate it? Seymour’s paper provides introductory answers to exactly that question, highlighting that it is a fairly simple process, but one that benefits from a systematic approach. He promises follow-on papers later in the year that will cover specific problem areas, but for the moment he reveals in this paper what 20 years’ experience has taught him are the most common mistakes that people make. Using real life examples illustrated using Future Facilities’ 6SigmaDC suite of tools, he shows how to overcome systematic errors affecting floor tiles, grilles, cabinets, cable bundles and other common data center objects. Seymour also provides advice on the “tough modeling decisions”, including whether or not to model poorly defined obstructions “such as water pipes under a cooling unit”. Specific advice is provided for calibration of the air supply system and its component parts, with Seymour cautioning upfront, “Do not overlook the fact that it is not just the bulk airflow that matters, but also the flow distribution”. By the end of the text, the reader will not only have a sound appreciation for good, systematic calibration practice, but also understand that, “while the overall facility is complex, many of the individual elements can be individually assessed”. Seymour concludes by saying, “this will make it possible to diagnose why the initial model does not adequately represent the facility… normally, it won’t!”. Mark Seymour is chief technical officer and a founding member at Future Facilities, which this year celebrates its tenth anniversary. With an academic background in applied science and numerical mathematics, Mark enjoyed a successful career in the defense industry for over a decade before moving to the commercial sector. There he has since accumulated 20 years’ experience in the cooling of data center and communication environments. A recognized expert in the predictive modeling of airflow for building HVAC and data centers in particular, Mark is an industrial advisory board member of NSF-ES2 research program and a corresponding member actively participating in ASHRAE TC9.9. 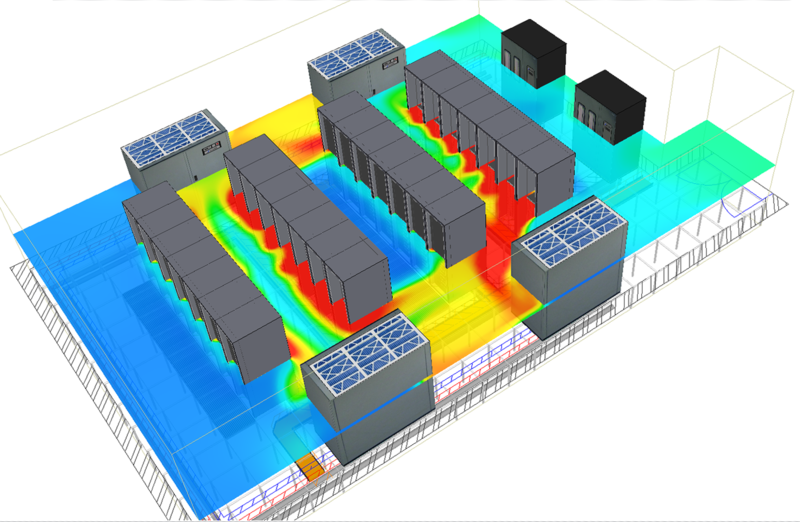 This entry was posted in Data Center DCIM Datacenter Datacenters Datacentre and tagged ASHRAE, calibration, centros de dato, CFD, claibrate, data center, Data Center DCIM Datacenter Datacenters Datacentre and tagged 3D, Datacenter, datacentre, future facilities, modeling, simulation. Bookmark the permalink.